In this lesson, you will learn how to play Four on Six, a standard written by Wes Montgomery. In 1960, Wes Montgomery’s album “The Incredible Jazz Guitar” was released with on it two of his most famous compositions, “West Coast Blues” and “Four on Six”. Four on Six is a great song to play and your audience will love it! Btw, if you were wondering what the meaning of the song title “Four on Six” is, it refers to a 4/4 rhythm superimposed over a rhythm of 6/8. Four on Six has a great intro that is made entirely out of fifths and played in unison with the bass and piano. The accents are followed by the theme again, then the break before the solos start. The chords are not very hard to improvise over, although the tempo makes it challenging (202 bpm). 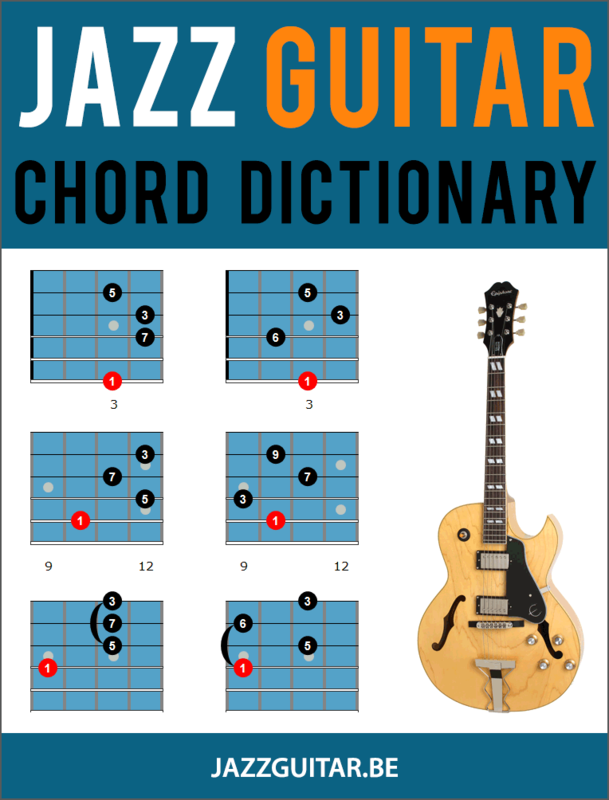 Over the Gm7 chord, Wes Montgomery generally plays the G Dorian mode, blues scales, and arpeggios. Another guitar scale Wes uses over Gm7 is the minor pentatonic scale or the minor blues scale. Here are the 2 main positions of this scale, but the same applies as above, learn the scale over the entire neck. The blue notes are shown in orange, use them to slide, hammer or pull into the notes D or C.
Here Wes Montgomery uses a unison-interval blues cliche. Wes also uses arpeggios over the Gm7, most of the times a Gm9 arpeggio. Wes also uses m/maj7 arpeggios. A minor/major7 chord is a minor chord with a natural 7. These are a series of 4 II-Vs.
On the theme, the dominant chords have a natural 9 and a sharp 11 (F9#11). The scale played on chords with these tensions is the melodic minor scale. Play the C melodic minor scale here. On the F7 the name of this scale is the Lydian dominant scale (4th mode of the melodic minor scale). Here you play Bb melodic minor, the same scale as in the above scale diagram, but 2 frets lower. Wes Montgomery doesn’t think in scales on this part, but in melodic patterns. That’s a good idea because the tempo is so fast, which makes it difficult to play scales musically. He usually plays a pattern on the first II V and transposes it down the neck for the rest of the II Vs.
Here’s an example where he uses a minor 9-11 pattern. Here’s another example, this time Wes Montgomery uses his famous octaves. Wes “strums” the octaves with his thumb, but you can also play them with thumb and index finger. The same modal part as bars 1 to 4, the only difference is a II V to Bbmaj7 in the last bar. Much appreciated! Great song and likely one of the best songs Wes ever wrote imho. This song shows his depth and monstrosity along with his knowledge and expertise combining chords, melody along with time and space! The beat alone brings many listeners onboard, even non-jazzers!! Thanks again!! I love this song!! Worth remembering it’s really just a version of Summertime. I taught the lydian dom scale is the 4th mode of the melodic minor scale and not the 5th as indicated. Long time guitar player, but first lesson, first day of jazz guitar. Thanks you for the lesson. One of Wes greatest tunes. I’ll be shedding this one for a while. Although these are all ii-Vs, there’s an underlying ‘hidden root’ these are based upon (at least in my way of thinking – perhaps incorrectly?). For example – the Cm7 is focusing on the Cm as the V to the key of the song in Gm and the F7 simply is the V in the ii-V relationship to the Cm7. The Bbm7 is the ii relating back to the Cm as I in the previous bar (and subsequently the Eb7 is the V in the ii-V of Bbm7 when the Bbm7 is acting as the ii). The Am7 takes a new turn as the Am7 relates as the ii back to the Gm7 (as the I), and of course the D7 is just the V in the ii-V of Am7. How is that related to the Gm7? or the previous Am7? It’s a bV of Gm, it’s not a tritone substitution either. What theoretical substitution rule or jazz tidbit am I missing on how that Ebm7 came to be in Wes’ head? Ab7 is the tritone substitution of D7 (the V of Gm7). Ebm7 is the ii of that tritone substituted Ab7. I hope that explains it, let me know if you have more questions. I realize now after reading your comment that the answer is in the very last measure of the 16 measures – as it ends with D7 – and your comment pulled it all together. Also stoked I got a reply within hours of posting! Excellent material. Thank you Dirk Laukens. I think you’re looking at the real book, which isn’t correct here. Check the recording, it’s D-Eb-D. Maybe the real book used a different recording or something or just a typo.